Outside of meeting up regularly for a rebalancing yoga sesh, there are plenty of ways we can manage our stress daily. We are beside Modo Yoga and on a recent #InspiredLife Blog post, Molly talked about Setting up healthy boundaries during the holidays as a way to reduce stress during this time. Over here at Seed, we think plants can help too. There are so many plants (edible and house) that can help us feel more relaxed and ready to take on the busyness. I know that my go-tos are usually junk food and fast food- the fast and easy answer when stress levels get high. But with the New Year ahead, its time to explore new and healthier ways to manage our stress and give ourselves the best start to the new year! Stress manifests itself in our bodies when we forget or don’t make time to practice self-care. Eating right and exercising regularly is part of that. When those start to go by the wayside, we’ll start to feel sluggish and off-center. By adding those vitamins and minerals back into our daily diets, we can fight back to help our bodies destress. Vitamin D’s nickname is the “happiness vitamin”, boosting happiness and mood levels when part of a daily diet. Vitamin D is a fat soluble vitamin that's not very common in foods, but many brands of soy milk, almond milk and orange juice are fortified with Vitamin D. Mushrooms are the only source of vitamin D in the produce aisle and one of the few non-fortified food sources. Antioxidants are a large part of the defense against stress, and are found in most whole foods, including fruits, vegetables, whole grains, legumes, nuts and seeds - the two most notable being blueberries and dark chocolate. Wild blueberry and lavender smoothie anyone? Magnesium is mineral that can help regulate your emotions and aid in reducing stress levels, as well as reduce signs of fatigue, irritability and depression. On our menu great sources of magnesium are found in avocado (we use it a lot), our chia seed yogurt, all the seeds we sprinkle on the salads, & of course our banana nut toast. Folate is a vitamin that helps our bodies develop dopamine, which is a pleasure-inducing chemical in the brain that helps keep us calm. Folate can be found in edamame, avocado and legumes. I’ve even included a link for a list of houseplants you could surround yourself with to brighten your mood and help beat the holiday stress. (Hint* more O2 production is good for everyone). 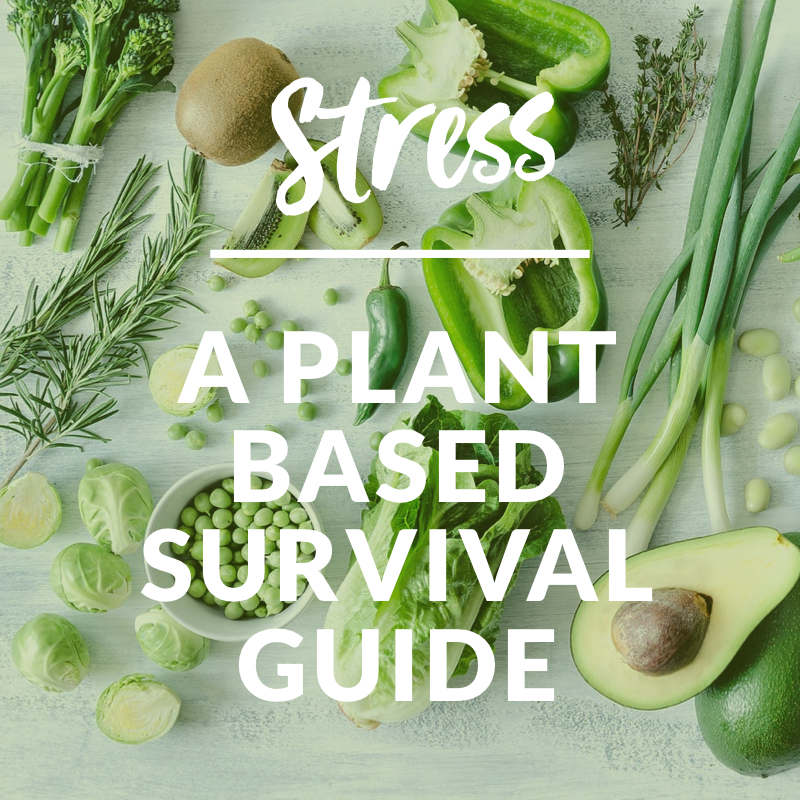 When you’re feeling blue or stressed and stretched to the limit, make yourself a snack or incorporate a couple of the above plants into your meals Who knows, this year may be the one we sneak through without all the nail-biting stress. (It is the holiday season don’cha know, wishes are made to be granted).